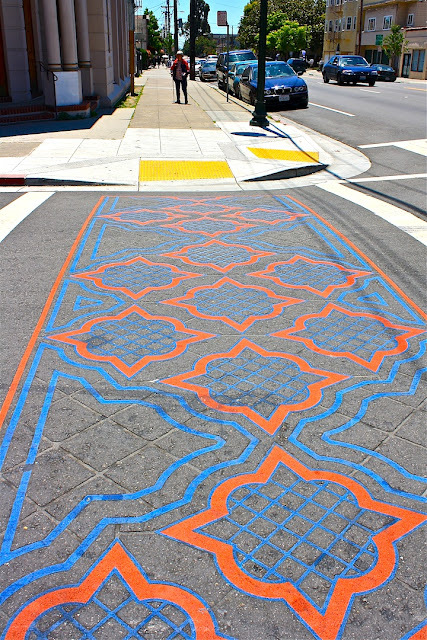 Sometime in the last couple of years or so, these colorful crosswalks have appeared in the Fruitvale district. You can't mistake where you're supposed to cross the street. These designs look Moorish too me, reminiscent of what can be found in Spain. This mural was commissioned by several businesses and is a collaboration between six street artists. I'm not sure I get the connection between the various scenes, but I find it visually compelling and amusing. This line of palm trees on Ivy Hill is all that remains of Arbor Villa, a mansion built in the 1890s by Francis Marion “Borax” Smith. Smith mined borax and transported it from Death Valley to a nearby train station by 20 mule teams. He used the mule teams to brand and advertise his product. After amassing a fortune in mining, he later developed the extensive Key System transportation system connecting the East Bay cities and San Francisco. The mansion was demolished after Smith's death in 1931. Smith is buried on Millionaire's Row in Mt. View Cemetery. Our afternoon skies remain clear and I'm linking to Skywatch Friday. This building, with its ornate pediments, graces 15th Street in downtown Oakland. Interestingly, I have not been able to discover what OTIG stands for. Some theorize that it was an insurance company, but there's no ready proof of that in Google Land. It is currently occupied by Lincoln University, a private college offering various degrees. Linked to ABC Wednesday. This vintage sign is on 14th Street. Amazingly, Ideal is still in business at its original site. The iron gate signifies "closed on Sunday." One of these days I'll drive by at night to see if the neon works. Out of town again for several days. After a brief interlude of rain, we're back to sunny days with an occasional fluffy cloud. We need the rain, so our fair weather is a guilty pleasure. Linked to Skywatch Friday. Spotted at an artists' enclave in West Oakland. Made me laugh. I have no idea what this is about but I admire the graphic design. It appears to be a collaboration between two artists but I found no signatures. This is found downtown at the corner of 14th and Jackson Streets. These large blank walls that face parking lots make great canvases and add visual interest to the streetscape regardless of how odd the image. Community gardens are found in many neighborhoods in Oakland. 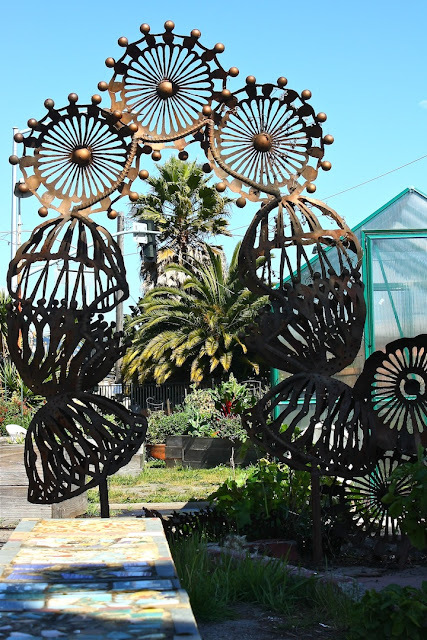 This one is on the Oakland-Emeryville (think Pixar) border and features sculpture by a local artist. I'll be out of town for a few days and won't have access to a computer to leave comments. The annual Qingming Festival was observed at Mt. View Cemetery this week. In Chinese culture it is the day of remembrance of the ancestors. The Chinese government has made it an official holiday. Similar to Day of the Dead traditions, graves are swept, ritual foods are offered, incense is burned and prayers said. Many of our schools have murals, typically painted by students. 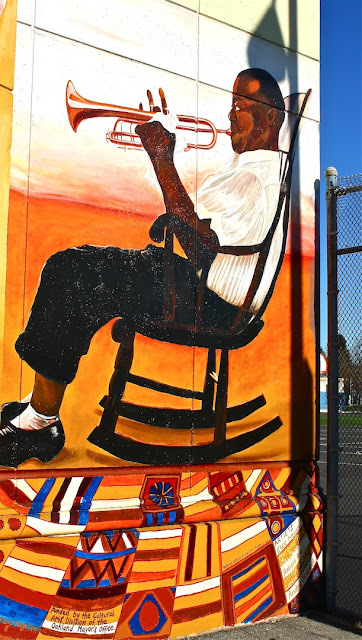 This one adorns a wall of McClymonds High School in West Oakland. We've had a dry winter but it hasn't stopped the wild flowers from blooming. Golden poppies are the state flower and can be found the length and breadth of California. They are always a cheerful and welcome sight. After two days of rain we are back to blue skies. Linked to Skywatch Friday. California redwood trees (Sequoia sempervirens) are some of the longest lived plants on the planet. This tree fell in a local storm in the 1930s and the cross cut is displayed at Joaquin Miller Park in the Oakland hills. The crack in the middle of this huge crosscut dates to 700 AD. The tree rings show when the Norman invasion of England occurred, Columbus sailed to the New World, and the Pilgrims landed in what is now Cape Cod Massachusetts. 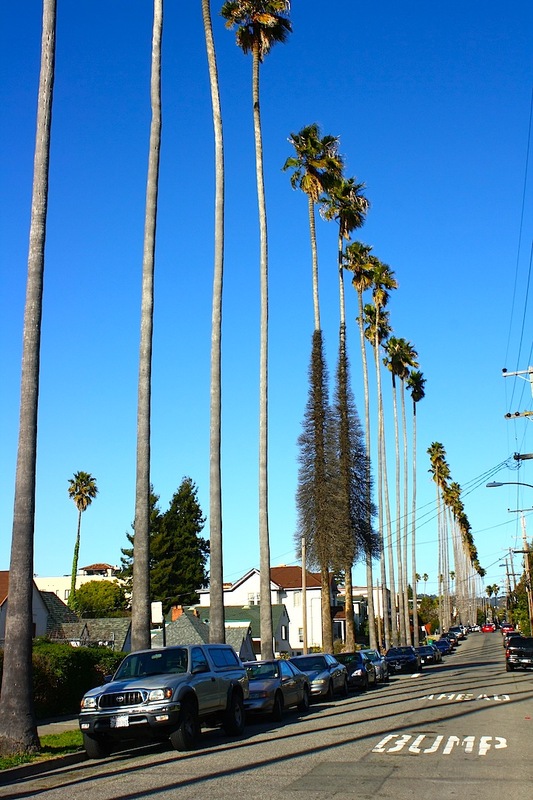 While almost all of the first-growth redwoods were chopped down for building projects in the late 19th and early 20th centuries, Oakland still boasts the largest stand of second-growth redwoods in California. This mural is found at Foothill and 26th Avenue. It was done by José Velásquez in 2001 and was sponsored by several community organizations. The colors seem as fresh as if they were painted recently. It's title is Roots, Spirit and Color of the American Dream.